Index of Indigenous Languages Index of Indian Tribes What's new on our site today! Some American Indian goods available for sale are not crafts per se, but rather traditional plant and animal products-- native herbs and spices like sage, tobacco, and sweetgrass, foods like wild rice and tea, traditional plant-based dyes and paints, and animal parts like tanned buckskin, feathers, and elk's teeth. All of these items have been traditional to native North America since ancient times, and many were first introduced to Europeans by the Indians. However, unlike all of the other arts and crafts featured on our site, there is no inherent difference between plant and animal products gathered by Indians and by non-Indians. A native herb or feather is just as well-made regardless of who gathered it. 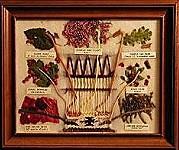 Nonetheless, if you prefer to buy herbs and other natural products from Native Americans--either because it's important to you to have the real thing or because you want to support native people with your purchase--then here is our list of American Indian herbs available from online stores. If you have a website of Indian herbs, feathers, or traditional medicine to add to this list, let us know where to find it. We gladly advertise any native artist or native-owned art business here free of charge. Thank you for your interest in Native American herbs and medicine! Sweetgrass, sage, cedar, tobacco, and bitterroot from the Wind River Reservation (Shoshone-Arapaho). Sweetgrass braids, white sage, and flat cedar for sale from a Vermont Abenaki gift shop. Alaska Native-owned store selling sage smudge sticks, healing oils, and hand-made soaps. Lakota-owned business creating herbal tea blends based on traditional Native medicine. Natural bug repellant made by a Maliseet-Passamaquoddy alternative herbalist. Framed collages of native Navajo dye and medicinal plants, with text explaining the traditional usage of each. In addition to beads, this Mohawk store sells porcupine quills, leather hides and thongs, fox pelts, and a wide assortment of feathers. If you're looking for a Native American medicine or tobacco pouch, have a look at our Native American Bags page. The first two artists on that page sell beaded Indian medicine bags as well as larger pouches that could be used to pack native herbs. Please do not buy these books thinking that they will teach you how to make medicine, cast spells, or cure cancer by eating things in your backyard. Use books like these as valuable sources of cultural and botanical information, not as some sort of medical cookbook. Like the medicine of any civilized society, traditional American Indian medicine is too complicated to learn from a how-to book in one afternoon. You wouldn't read a book and then perform an appendectomy on your child. Please do not read a book and then put him in a makeshift sweat lodge. If you ignore this sensible advice, neither we nor the authors of these books are liable for what happens. Nice-looking book of Indian herbs and their traditional uses by an ethnobotanist. An encyclopedia of Native American herbs and plants and what they have historically been used for. Book by a part-Indian woman on the various tribal traditions regarding native herbs. Guidebook to North American Indian herbs and their uses. a route to Native American spirituality, please read this article on the subject first. Traditional Herbal & Plant Knowledge: Excellent series of articles about Indian medicine by the late Ojibwe author Paula Giese. Kainai Plants and Culture: Database of Blackfoot Indian herbs, plants, and traditional medicine. Native American Ethnobotany: The University of Michigan database of plant-based foods, drugs, dyes and fibers of Native American peoples. Medicine Man: Article about traditional Native American healers and the role of their medicinal knowledge. Native American Herbs in Folklore: Information and links about traditional American Indian beliefs about native herbs and medicine. About us: This website belongs to Native Languages of the Americas, a non-profit organization dedicated to preserving and promoting endangered Native American languages. We do not sell herbs or feathers ourselves, so if you are interested in buying some, please contact the sellers directly. Though we have featured only Native American herbs and natural materials identified with the names and tribal affiliations of the vendors, we haven't called the tribal offices to check up on any of them, and we do not know them personally. We also don't guarantee any product and particularly recommend that everyone exercise caution and common sense using herbs, just as you would with Western medicine. This is not an exhaustive list of Native American herb sellers--if you would like us to add your herbal site to this page, please contact us with your URL and tribal affiliation. We advertise any individual native artist or native-owned art business here free of charge. We do not link to native herbal medicine which is not made by tribally recognized American Indian, Inuit, or First Nations people, so please do not ask us to. And finally, websites do occasionally expire and change hands, so use your common sense and this general rule of thumb: if the herb-seller is not identified by name and specific tribe, you are probably not looking at genuine Native American herbs.